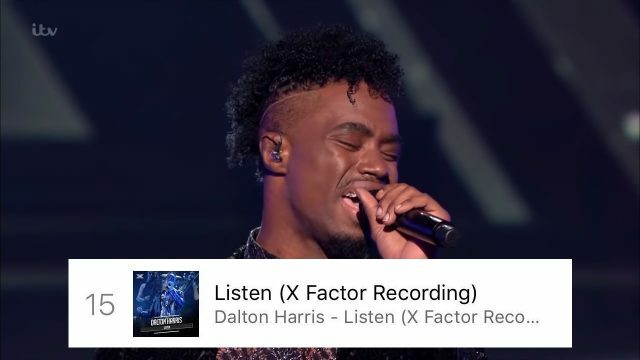 Dalton Harris’ belted out ‘Listen’ by Beyonce’ during the X Factor UK’s Big Bang theme week on Saturday and it soared on the UK iTunes charts where he’s currently the only competitor of the final 8 in the Top 100 at number 15. 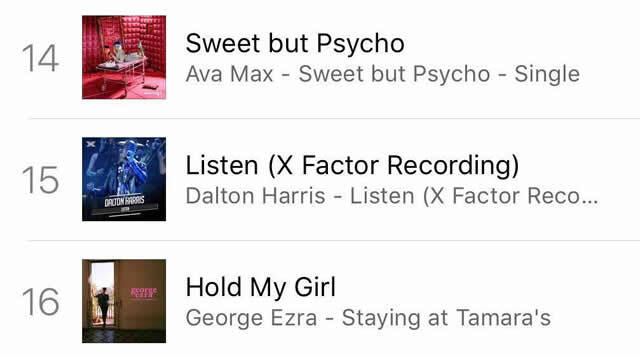 Harris is yet again the most viewed contestant this week with his ‘Listen’ rendition racking up 320,000 views on X Factor UK YouTube channel, doubling that of his 7 competitors. Downloading or streaming a song doesn’t help that act stay safe, so be sure to also vote for your favourite for free using the official X Factor UK mobile or tablet app before lines close on Sunday evening. Harris, who already has fans worldwide naming him the winner of this year’s competition, also has another studio version of his past live performances in top 100 at 94. It’s also worth noting another of his performances slid just out of the top 100 this morning and is now at 102 of the top 200. The 2018 X Factor results live shows return Sunday at 8 PM on ITV.